By any objective standard, Joe Newman is not the kind of guy you expect to see leading a photography Meetup. He describes himself as a shy introvert and is very uncomfortable describing himself as a photographer. Yet, in the last year, Joe has built a fast growing and very engaged group of photographers around his Meetup group and blog, DC Focused. 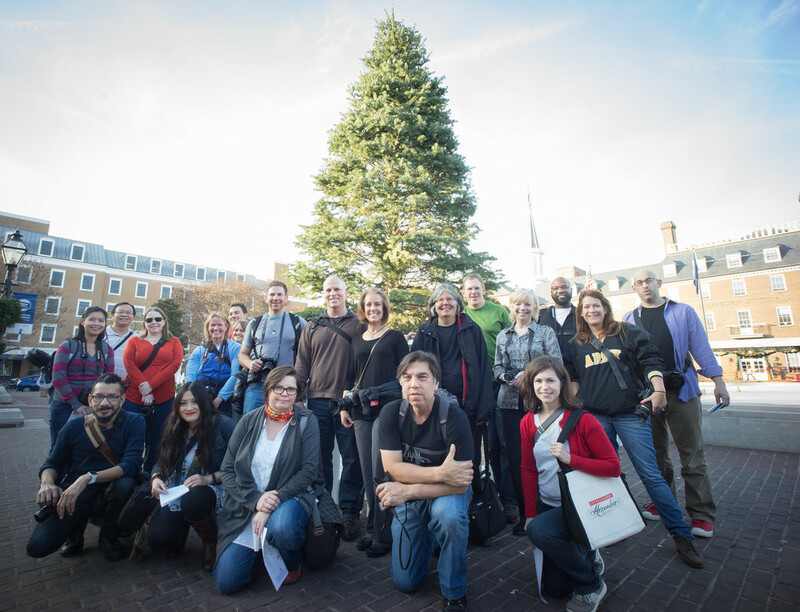 The DC Focused photography community lives on Meetup, Facebook, Instagram and Flickr. Their Meetups are not just photo walks but challenges and an opportunity to be published. A funny thing happened as Joe created this new photography Meetup and community. He became a better photographer. Q. You said before that you don’t see yourself as a photographer. That’s interesting to me because you have now successfully branded yourself as a photographer as a result of DC Focused. A. I get very nervous calling myself a photographer. I came up in the news business. I was a reporter for many years at different newspapers, and I worked with so many talented professional photographers. To me, those guys are photographers. I’m this hobbyist and enthusiast who is trying to become better. I’m trying to learn different techniques. I’m trying to learn the technical side and the artistic side. When I call myself a photographer, I think back to the many professional photographers that I worked with, and I’m humbled by my knowledge of their work. I do see myself as a writer and photographer who is continuing to grow. I don’t even know how I’d classify myself. Q. Tell me about how you started the Meetup and why? A. I had never done a photo walk or a Meetup before, and it wasn’t something that interested me. I’m an introvert by nature. The thought of getting together with other people to go take pictures was not really my cup of tea. I’m a street photographer. I want to go out on the street by myself, unseen, and move around without other people noticing me. You can’t really do that in a group. But as the DC Focused blog grew, I knew that there was a need to coalesce a community around the blog. Q. Why did you think there was a need to build a community? A. I was starting to get people who were sharing the posts. I created a Facebook page, so I knew there were people who were seeing my stuff. I could tell that whenever I posted the Friday roundup of photos, there was a lot of excitement around it. There was an opportunity to host a photo walk with 500px. They were doing a global photo walk, where they were organizing photo walks all over. I looked to see if there was anything organized for DC, and there wasn’t anything organized for us. I thought that was strange, so I emailed the people from 500px and said that I’d host a photo walk. They said great! I’d never hosted a photo walk before. I’d never been on a photo walk before. I put it together within two weeks, and we had 30 folks show up. And it was fun! A. I was surprised! I was surprised that I could have fun with a group of people taking photos. I had not done that before.That’s really what inspired me to create a Meetup group, that experience with the 500px photo walk. I didn’t shoot a lot of pictures on that photo walk. You’re more interested in making sure people are engaged and feel like they are being paid attention to, if that’s what they want. After these walks, it’s very important that you meet someplace and unwind. The conversations are always great. You’re talking about things that you are passionate about. You are talking about photography, and that’s cool. I had been to a couple Meetups, so I decided to start one. Meetup is a pretty good platform for promoting their groups. They get you out there, and they get you new members. At that point, you have to find things that engage folks and that are going to interest them. It’s a lot of pressure. You can do sunset shot at the Lincoln Memorial, and you’re going to get people to show up. That’s great. I wanted to step it up a bit with my Meetup. Since a lot of my interest was street photography, we did one that was a scavenger hunt. That’s not an original concept, but it’s fun! You got together and tell people the three of four shots that they should look for… sometimes I throw in a $20 B&H or Amazon gift card for the winner. On my U Street Meetup, I had a popular Washington, DC street photographer as my judge. It was fun. Q. What were the shots? A. There were five. There was one portrait shot, one architectural detail shot, a shot that took advantage of shadows and light. I forget the others. What I learned from that is that there were too many. It’s hard to get five shots in two hours when you are trying to work that one detail shot for half an hour. Two or three are great. That’s something we definitely want to continue to do at the Meetup group, the scavenger hunt and contests. The other thing that sets us apart at DC Focused is every one of our Meetups is advertised that you submit your best shots, and we pull them together for a blog post. You are going on our Meetup, taking pictures and contributing. Then we have a wrap up blog post with at least one photo from everyone who contributes. It goes back to you are getting your photos published, even if it goes to a small blog like DC Focused. Q. What have been your lessons learned starting and creating a Meetup group of photographers? A. Have them often. We could have them every week, and we would have people who would want to show up. We live on several different platforms because there are so many channels nowadays. We have a Facebook group that’s very active with people posting links and photos they’ve taken. We have an Instagram community that we’re trying to build, of course, I have the Flickr community. There are all these platforms that people are participating on. The Meetup group is part of that. The other lesson lesson is to try to engage people through social media. Meetup is great for getting the word out about your event. You can email everyone about your Meetup, and they’ll get messages and updates. But it’s not really a very social platform. What you really have to do is..if you have people who are coming to you first through the Meetup, the task then is to take them and move them to one of your other channels. Move them to your Facebook group or Flickr pool. When the DC blizzard came, we really exploded with people wanting to share, comment and participate. That was very satisfying. We now are moving into the active community. Even if because of the winter time we aren’t having two or three Meetups a month, we’re still communicating and still sharing through our other channels. A. I learned that even introverts can become people who can organize and lead groups. I’m a shy person. At cocktail parties, I go there, stand in the corner and then leave. And then I need a drink because it is very stressful. Learning that there is this big community of photographers out there who participates, who reads my blog and contributes to my blog, that has helped me move to this next step of leaving my day job and doing other things. I now own JoeNewmanPhotography.com. Will I turn that into a brand where I do portraits and work as a photographer? I think so. I think I’ll try to do that, but I still feel that pressure to up my game. There’s not a lot of room for errors when you start taking money for photography. Q. If someone is thinking of starting a photography Meetup group, what are the one or two things you wish you’d known when you were starting? A. First go to some Meetups and see what they are about. Ask yourself if you really need to create a Meetup because there are plenty of opportunities out there. I do understand the need that some people like myself have for organizing things. Even if I was doing it for some other group, I would want to be an organizer. Do a couple Meetups with other groups. See what works and what you like about them. Always have an ending point where you can get back together and reconnect. On a walk, people tend to spread out. Some people pair up, others will just go out by themselves. You can lose that connection with your group, so always have that place to reconnect. Do your homework and find a place that will have enough room for your group and isn’t too loud. You want to have conversations. When I plan a Meetup, I plan around two things — 1) Public transportation. I try to have a start point that is accessible to the Metro 2) I try to scout for a restaurant, bar or coffee show where we can all meet. When you post an event on Meetup, you will get a lot of people RSVPing. Typically about 70 percent of the people who RSVP will show up. You always have to build in the expectation that if you have 50 people sign up, only 35 might show up. Keep them relatively short — between 1.5 - 2 hours. Some people will have to leave early. Not everyone will be able to stay after, and that’s fine. With so many things happening in DC, what I do is go to Facebook and search through the events. A lot of times, when someone is hosting a public march or rally, they create an event page on Facebook. You can search through those events and see what might be an interesting photo op. A lot of time people who are beginning street photographers are shy and nervous about photographing people on the street. That’s the thing a lot of times with beginning street photographers, their pictures are always from too far away. With our emphasis on street photography, we try to find an even like a parade or soap box derby or some place where there is an expectation that your picture might get taken. You’re not as nervous taking photos when there are crowds. In crowds, you are a photojournalist. There’s a rule there that anyone in a costume or anyone with tattoos will gladly pose for you. You’re a model because you want to show off that costume or you are proud of your tattoos. I always carry business cards. Whenever I take a photo of someone on the street, I always hand them a business card and tell them to email me. I will send you a picture. Typically only 30 percent will ask me, but I always send them a photo. Click to download your free ebook and audio book. Q. What’s been the most rewarding part of this journey for you? A. I don’t know if there is just one thing. It would be my personal growth as a photographer. I look at my work from three or four years ago, I had the beginnings of it. I’ve really come a long way. My technique and post processing have come a long way. That growth has been very rewarding. As far as the community goes, just meeting so many people has been rewarding. I know so many people in the community. They know me because I am the central face behind DC Focused and that’s rewarding. These are people I’d love to have over to my house for a barbecue. The DC photography community is wonderful. Go to Meetup. Input your zip code and your interest as photography.